A big motivator for some individuals to attend law school is the ability to positively influence the communities from which they come. However, what assistance can a lawyer provide for their neighborhood if they feel the community is being unfairly targeted by law enforcement? How can members of the profession have a positive effect on incarceration rates through the application of restorative justice techniques? In this episode of the ABA Law Student Podcast, host Fabiani Duarte, along with guest host Andrew Scott and guest attorney Sarah Walton, take a look at mass incarceration in our criminal justice system and how restorative justice concepts could be applied. Sarah begins the interview by explaining her self-proclaimed moniker as a “free range attorney and abolitionist” and gives some insights into what those labels mean to her. She then talks about her work to help reduce the number of incarcerations through programs like pre-arrest diversion and some restorative justice tactics that law enforcement can implement to ensure the safety of all parties involved. The group then takes a moment to reflect on the disparate effects that The War on Drugs has had on low income communities and how new harm-reductive approaches to drug policing can improve public safety. Sarah then wraps up the discussion with an analysis of the stigma citizens returning from incarceration face in their communities and the things that law students can do, like attending court proceedings, to support members of their communities. Sarah Walton, Esq. is a 1989 graduate of the New York University School of Law. She graduated from Earlham College in 1981 with an interdisciplinary major in human development and social relations. She is a former Assistant Attorney General for the State of Maine and is co-author of Maine Law Enforcement Officer’s Manual. For ten years, she was professor of criminal justice and justice studies at the University of Maine at Augusta. Since September 2012 she has resided in Georgia where she assists individuals, community groups, and governmental agencies in working to increase public trust in the criminal justice system and to enhance the safety of everyone in the community, including law enforcement officers. She is Director of Policy and Community Outreach for the Parental Empowerment Institute, where she is working to bring a pre-booking diversion program to DeKalb County in metro Atlanta. In this monthly podcast we interview guests and cover topics of interest for law students and other graduate students plus recent grads, from finals to graduation and the Bar exam, to finding a job. We hope this show is a trusted resource for you, our listeners. This past year, as I have explained in previous episodes, has been a special one for me as I’ve been able to wrap up my last two semesters of law classes at Mercer Law while also kicking off my first year in seminary at Mercer’s McAfee School of Theology. One of the classes I have been able to experience that offers an intersection of law and theology is a class called Restorative Justice taught by Professor Melissa Browning. In this class we have focused on social and restorative justice issues as they relate to the criminal justice system in America, and we have focused on areas such as the Black Lives Matter Movement, the death penalty as its enacted in our country today, and also the issue of mass incarceration and how if affects many US citizens. I have asked a fellow McAfee seminary student to help me co-host each episode in this short restorative justice series. Today I’d like to welcome my friend and colleague, Andrew Scott. Andrew Scott: Thanks Fabi! Thanks for the invitation and the opportunity to be a part of this podcast. Fabiani Duarte: Well, why don’t you tell us a little bit about yourself? Andrew Scott: I am from the foothills of the Great Smoky Mountains in East Tennessee, an alumnus of Carson-Newman University in Jefferson City, Tennessee and I am in by first year, finished and got my first year at McAfee at Mercer, Atlanta where I am studying Christian Ethics. Fabiani Duarte: Awesome! Well, welcome Andrew, I appreciate you helping me co-host today’s episode. For today’s show we welcome attorney Sarah Walton. Sarah is a 1989 graduate of the New York University School of Law in New York City. Before NYU, she graduated from Earlham College in 1981 with an interdisciplinary major in Human Development and Social Relations. She is a former Assistant Attorney General for the State of Maine and is a co-author of the Maine Law Enforcement Officer’s Manual. For ten years, she was Professor of Criminal Justice and Justice Studies at the University of Maine at Augusta. Andrew Scott: Since September 2012 she has resided in Georgia where she assists individuals, community groups, and governmental agencies in working to increase public trust in the criminal justice system and to enhance the safety of everyone in the community, including law enforcement officers. She is Director of Policy and Community Outreach for the Parental Empowerment Institute, where she is working to bring a pre-booking diversion program to DeKalb County in metro Atlanta. Fabiani Duarte: So welcome Sarah Walton! You describe yourself as an abolitionist and as a free range attorney — a human rights attorney that is, in our contemporary context, what does that mean? Sarah Walton: Well, what that means is that I work in various capacities, both as an attorney representing individuals but also as a community advocate as someone who helps nonprofit organizations and governmental agencies in creating a more just society in one in which we decrease the numbers of people who are entering our criminal justice system. So working on prevention to enhance public safety; also, reducing the numbers of individuals that are under correctional control that includes both in jails and prisons and also on probation and parole, and to provide for adequate resources to increase the likelihood of successful reentry. The ultimate goal being the abolition of the need for prisons and jails; now, yes that’s a far out goal but I think it’s one that we should be striving for as a society. I also view myself as an abolitionist in that. When I was in law school and we studied the 13th Amendment, I don’t think I really paid attention to the big exception that’s in the middle of the 13th Amendment. I think I just read it as saying neither slavery nor involuntary servitude shall exist in the United States or any place subject to their jurisdiction. But it’s a big exception, it says accept as a punishment for crime whereof the party shall have been duly convicted, and in our country right now, we have huge numbers of people who indeed are still subject to this involuntary servitude, and that’s where I’m asking that we have vigilance in making sure that as we look at our criminal justice system that we view this society as — is this the kind of society that we would set up? If we going into society just like John Rawls says in his Theory of Justice. If we came from a veil of ignorance and didn’t know what circumstances under which we would be born, and the system that we have now there are huge numbers of children whose families have members who are incarcerated and that has sort of adverse impacts on them in a variety of ways and on their wider communities, so that’s what I am looking for is a way to increase system of justice. Fabiani Duarte: So what do you think law students, theology students and any of us who are interested in entering the professional world and have to deal with issues of justice, what do you think we should know about restorative justice? What are some principles about restorative justice that you think is important for us to take into those fields? Sarah Walton: Well, I think first that even the idea sometimes that we use when we say the word “restorative justice” that we are restoring to some ideal that has not yet existed. I know, when I was in the State of Maine, working when Maine native peoples and asking the question, what does justice look like, and being told I’ve ever seen justice, and so that’s part of — I don’t want completely be a quibble with the term restorative justice, but I think what we should be working towards is a society that just as with the theology students who were studying are kindom as you had spoken to me they are — we are brothers and sisters that kindom and the fact that I look at for example Hebrews 13:1-3 where we are encouraged to keep on loving each other as brothers and sisters and to remember those who are suffering as if we were suffering, to remember those who are in prison, as if we were in prison. To help us understand that it is possible to gain greater empathy for our fellow human beings because I know there have been times when we can’t quite imagine that we too could find ourselves in the same position as somebody else but we need to sort of as human beings develop that capacity for empathy. I know, sometimes it helps people to change their perspective as to what can be done, what’s possible by putting themselves in that position of that other person, and I frequently ask people or tell them when I’m dealing with a situation trying to help an individual client that I need their help and I need them to take a look at what might be possible in this circumstance, and the truth of the matter is that I sincerely hope that they nor anyone they care about ever finds themselves in the particular position of one of my clients. So I’ve had clients for whom the criminal justice system with its requirement of payment of these massive supervision fees or the threat and the actual incarceration for failure to pay supervision fees or other fines, even though in 1981 the United State Supreme Court in a case called Bearden v. Georgia told the State of Georgia and the rest of the United States that it is unconstitutional to incarcerate people merely for their inability to pay. Obviously, if you have the resources and are absolutely refusing, that’s a different issue, but for many of my clients they do not have these resources, and we’ve still seen even last fall I had a client who the Judge said that there were the $71 that she was able to pay towards her traffic ticket, was not enough. And so he was a commanding that or demanding that she’d be incarcerated. And for her this was more than traumatic and unfortunately what she chose to do was to grab her baby and leave the courtroom, which then added to another legal problem which was escape. But we shouldn’t in the first place have the judge making these orders to order people into incarceration merely for failure to pay or to pay sufficient amounts. Andrew Scott: You mentioned that you work on reducing the number of people entering jails, can you tell us a little more about this work? Sarah Walton: Yes. There are a number of programs across the country called Pre-Arrest Diversion or Pre-Arrest Booking programs, and what they do is, in those programs when a law enforcement officer could be exercising his or her discretion to arrest the person and take them to jail, instead connects them with high-quality community-based treatment and support services. There is a tremendously wonderful program in San Antonio; it’s in the county in which San Antonio is located which is particularly good at delivering a strong mental health team response. Because a lot of times officers themselves will tell you that they see the same people over-and-over again in their same situation, but what the underlying cause is it’s related to substance abuse, mental health, employment, housing, lack of housing, issues that just become exacerbated. The longer your criminal record is the harder it is to have those resources. So instead of having folks directly just continue to be put in the system, instead addressing the situation with making sure that people actually, and of course, people make a choice, if they are willing to meet with a peer support specialist, somebody who has been there as well as a case manager to get an intensive case management treatment. One of the lead programs is actually called LEAD, it’s in Seattle which is an excellent Pre-Arrest Diversion program, and here in the Atlanta metro area, the City of Atlanta and Fulton County have agreed to pilot a Pre-Arrest Diversion program here, which will be fabulous. And what we’re trying to do is work with community groups to expand the whole idea of having Pre-Arrest Diversion programs to other metro Atlanta communities and counties. For example, if we look at some of the incidents that we’ve had in metro Atlanta area and we have seen it across the country where the police response to somebody who is in a mental health crisis, it can be enhanced by having the police receive good crisis intervention team training, but what’s often lacking are the community resources, and that’s one thing that I really ask our listeners to think about. Long long ago when we deinstitutionalized those with mental illness, we released them into the community, we said there would be community resources but somehow that never materialized. And so unfortunately our criminal justice system ended up being the place in which many of our citizens who have mental health issues, substance abuse issues ended up being “treated” and it’s really not adequate treatment. So that’s what we’re trying to encourage is to say, okay, there’s better ways to deal with this and these Pre-Arrest Diversion programs have been shown to be very cost-effective. Particularly, I think there was one in New Mexico that within three years they were recouping their cost. Yes, it costs money upfront to house people and give them services, but you give people an opportunity to rebuild their lives and to get on track, then you don’t have the huge expense of being part of the criminal justice system, and you repair — I suppose that would be part of restorative justice, you’re repairing some of the broken bonds, but you’re also strengthening not only that person or encouraging that person to be able to fulfill their potential, but it has a big impact on their family and their community as well. Fabiani Duarte: So Sarah, you’ve mentioned a lot of policies just now that you think could help reduce the incarceration rates. I know you’ve done a lot of work when it comes to police training, policing tactics, what are other changes that you think could help build a better criminal justice system in your opinion? Sarah Walton: Well, I think we are seeing a great window of opportunity right now around the country to make some substantial changes. The report that came out of the City of Chicago just this week was really eye-opening. It was interesting to me that one of their recommendations was a recommendation that the Police Executive Research Forum had made in January. In January, that organization (PERF), the Police Executive Research Forum recommended 30 principles to be implemented by police when it comes to use of force. And it was interesting that the first principle is a principle that I think your theology students as well as community members and law school students and attorneys perhaps should be able to get around, which is having a first principle being the sanctity of human life. That means the sanctity of human life of and safety of all of individuals involved. Frequently, now with our criminal justice system we have a lot of cases that are sometimes termed lawful but awful. It’s lawful, it’s justified use of force under the current United States Supreme Court decisions, but goodness, couldn’t with using best practices that we could have avoided those awful results. So for example, with Tamir Rice in Ohio had instead of the police responded by driving up immediately right to where that individual was, instead had parked some distance away where you could still observe and see what was going on, that there are other ways that you could have dealt with that situation if you were wanting to make sure that with best practices you might decrease the number of circumstances that you ended up having forced that was supposedly justified, but perhaps you might want to look at it from another perspective of trying to make sure that we really were protecting and serving and making sure that everyone got to go home at the end of the day. And so, for example, one of the PERF recommendations, the Police Executive Research Forum recommendations in January was to eliminate the training principle that a lot of law enforcement the majority in this country receive, that’s sometimes referred to as the 21-foot rule and with the 21-foot rule, the training is interpretive by officers to mean that if a person comes within 21-feet of them is armed with what’s believed to be a knife or a sharp-edged object that it is a justified use of force to then shoot at center mass, and there are so many other alternative ways of responding in many of those circumstances than to respond with deadly force in that instance. And so, that’s the kind of training that — and tools, there are these various other law enforcement tools, I mean, there is even this to my mind kind of amazing tool that’s used in Japan that sort of shoots out a net over the person to, I mean, which would make them a little bit less able to jump out at you within that 24 foot range, I don’t know, but there are a number of different options. So if we were to replace some of our current training with training and policies that we are focused on preserving the sanctity of human life I think you’d have a change and every single law enforcement agency has a set of standard operating procedures. Almost all of them now in this day and age are in writing and usually as a citizen, a law student, an attorney, a citizen of any sort, you can under your State’s Open Records Act or Freedom of Access law request a copy of either the specific policies or the manual. Ideally and some agencies are being more transparent and are actually posting their policies and manuals online, which is recommended, but you can see what those policies are, and sometimes you will see, well, goodness, there are ways that those policies could be improved. Fabiani Duarte: Sure! And so those policies though laudable in many cases sometimes criticisms that arise about them are that the police who are being asked to enact these policies are not protecting themselves enough or putting themselves in more arms way because they are looking out for the well-being of those that they are approaching. So like if the net, for example, tactic was something that we had an account to that is what is the net going to do when you have somebody with a knife or a firearm, how is that going to be effective? So what kind of response do you get to push back that says that restorative justice solutions like that though good in theory and practice aren’t as wise? Sarah Walton: Well, I think that’s where we need to look at the policies as a whole. I mean, one of the major recommendations of the PERF report in January was for de-escalation, training police in the use of good communication skills to try to de-escalate and as I have discussed with having a good Pre-Arrest Diversion program where you had mental health response as well as good training because a lot of times in this country when it ends up being that we have unarmed people being shot by police that the person was having some sort of a mental health crisis. And so it really helps to be able to have good resources, helps to have good training in crisis intervention and quite a variety of policies that can working together have a good result. I mean, some of those policies are controversial and you can argue that there might be some extreme circumstances under which having a blanket rule, for example, one of the PERF’s recommendations that was probably most controversial was a rule against shooting into a moving vehicle. So the rules said the police should not shoot into a moving vehicle because that is very dangerous in most circumstances because you don’t know what’s going to happen next, it can hurt by standards as well, but of course, there are going to be some circumstances under which there may be exceptions to that rule. But if you had a general rule against shooting into moving vehicles, you would save lives, both of law enforcement and other citizens. So the whole thing is focused on the increasing public safety and safety of officers as well as other members of the public, and so that’s what this focuses. Andrew Scott: In this month’s edition of Harper’s Magazine, there is an article by Dan Baum, Legalize It All. The article quotes one of Nixon’s policy advisors who admits that the war on drugs was a political tool targeting Blacks and Hippies. Can you comment on the relationship between the war on drugs and our country’s current incarceration rates? Sarah Walton: Yes, excellent question! It is so true. We’ve had these long-standing disparities in sentencing and disparities in law enforcement as well as this increased attention of law enforcement in arresting particularly for low-level drug offenses that looking back at it, I know that I was really taken aback when I listened to Matthew Fogg who was a United States Marshal, who has talked extensively about how when they were on these drug task forces that they were told that no, we don’t do the enforcement in the more well to do suburbs even though the drugs are there and the research shows in the same or higher quantities. So you ended up having a system in which officers and departments were rewarded for the numbers of arrests, you ended up with promotion, you ended up with more equipment that you could get from the Federal Government, it was civil forfeitures as well where you are really going after as many arrests as you can but arresting — tending to arrest in communities that were oppressed, were arresting people who have been arrested before that made it more difficult for them to contest the charges. We have people that do end up pleading guilty even when they’re not guilty because otherwise they’re just going to stay in jail awaiting sentencing for really long periods of time. Even I was shocked to discover that the Speedy Trial Act in real life doesn’t seem to mean what I thought it meant in law school, where you have people that are staying in jail for up to 18 months if you’re waiting, saying you insist on having a trial. With the war on drugs, we’ve seen lately an increase in white suburbanites with heroin addictions. I think coming off opiate addictions with tighter control of the opiate drugs and it’s interesting, you can sort of see the racial component to it because now that you have white suburbanites with a heroin problem, you see an increased tendency, it’s still not there completely but it is an increased tendency to try to find a medical model, a medical response to this problem; whereas, when you had the problem being focused in low income minority communities, the response was with arrests and incarceration. Fabiani Duarte: Right. So just continuing down that line, what would you think about new harm reductive approaches to drug policing then? Fabiani Duarte: What are some examples of that? Sarah Walton: Well, for one thing if people get the treatment that they need then you’re less likely to have people breaking and entering to steal money for drugs and to feed their addictions. You will instead of destroying communities, you will give people an opportunity to build their lives, rebuild their lives and have access to the treatment, the resources that they need in order to get better. When we just incarcerate people, even though we like to think that we are incarcerating people and they are not going to have access to drugs in fact we do know that in many of our prisons and jails, you can get any of the drugs they could get on the street, it’s just is going to cost a lot more. And when you have people who are incarcerated the skills that are frequently enhanced while one is incarcerated are not the human being skills that one needs to successfully function in the outside world that the long we in this country incarcerate people for much longer periods of time, then happens in the rest of the developed world, it’s just much better for people to receive the treatment that they need on the outside. I mean, of course there are going to be times when you need residential substance abuse treatment but getting real treatment and not the — because being incarcerated what little programs that are on the inside are just not effective. Andrew Scott: You have mentioned the stigma that returning citizens’ face, in what other ways can community support returning citizens? Sarah Walton: Well excellent! One way to support returning citizens is to realize that these are our brothers and sisters and some of the barriers that have been put in place can be addressed both at a local level and at a national level. So for example, just last week, there were new HUD regulations, Housing and Urban Development regulations that were coming out to address the problem that many returning citizens were having finding housing because if you have somebody released and they can’t get housing that’s just going to be one more opportunity for increasing that cycle of recidivism where people end up committing more crimes. I know one of the clients that I helped out, it was just really hard for me to discover that a single man — a man who is single, could not get housing,, if he didn’t have any resources in this particular area unless he could somehow get himself into one of the very few slots for substance abuse program or other than that, so it’s just hard. So when you have people who are sleeping under the bridge that is not going to be conducive to public safety. People are breaking into houses and it does not — overall it’s just is not helpful. Fabiani Duarte: You have written and testified a lot about ways that racial and economic injustice possibly exists in our criminal justice system and there are different ideas that have arisen like Misdemeanor Probation and For-Profit Probation, do you have any knowledge about that? Sarah Walton: Well, I think that Misdemeanor Probation has been particularly horrific here in the South where if you have money and you have a traffic offense or some other minor offense you pay your fine and you’re done with it, but for example here in Georgia, in some counties and municipalities they have private probation for this misdemeanor probation, sometimes it’s run by the government themselves, but in either case those who cannot pay end up paying a monthly supervision fee for the privilege of this delay and being able to come up with all of the money at the same time. So it creates a situation where you’re setting people up for failure, you’re holding over them the threat of incarceration if they can’t come up with the money. It does not create a good system. It creates a system that our Supreme Court has told us that we should be avoiding. We should not be having incarceration for people just because of their indigency. Fabiani Duarte: So as we wrap up today’s episode what’s the big takeaway that you think that the law students, theology students, and anyone else who wants to enter the public sphere to work on criminal justice issues or restorative justice issues needs to keeping in the forefront of their minds do you think, what is the word of wisdom that you would provide them? Sarah Walton: Well, I would first look to Bryan Stevenson, the author of ‘Just Mercy’ and that great quote that says, “We are all implicated when we allow other people to be mistreated” and the truth of the matter is that it’s actually in everyone’s best interest to have a criminal justice system that is fair, and perhaps even more importantly, is perceived to be fair. There is a wonderful study by Thomas Abt who was Senior Research Fellow at Harvard, Kennedy School of Government that says that multiple studies have demonstrated that controlling for other factors when communities view the police and the criminal justice system as illegitimate they become more violent, and so it’s really in all of our best interest to have a system that is fair, that is perceived to be fair, and so one thing that citizens can do whether they are law students or attorneys, community members of other sorts, is to actually attend court proceedings. Take a look around, you will discover that in many of our communities when you look at the defendants in the room shockingly often it looks as though they are almost all people of color. And sometimes that has to do with selective policing or policing that is based upon trying to make sure you increase your numbers of arrests, your seizures of drugs, and your tendency to focus on communities that are less likely to be in a politically powerful position to object. So I would encourage citizens to exercise their rights to be active and informed participants in their government and making sure that police agencies have the support that they need to enact good policies to have the resources that they need for training, for equipment that would be looking at a system that would be perceived to be fair as well as actually being fair — it would rebuild community trust. Fabiani Duarte: And one final question, Sarah, that we ask nearly all of our guests on this show, what would you call your life’s motto or how would you put your calling into words? Sarah Walton: Excellent question! My life’s calling into words. Well, I would say that my life’s calling put into words might be that following the words of Stephen Grellet, a French Quaker from long ago is that I may pass this way but once, if there is any good that I may do; let me do it now. Fabiani Duarte: Thank you so much, Sarah. Sarah, thank you for not just those words of wisdom but your expertise that you bring to this subject for a great conversation and for joining us today, we really appreciate it. Sarah Walton: Thank you. Thank you so much. Fabiani Duarte: I would also like to encourage our listeners to find out more about the work that Sarah does at some of the links we will place in the podcast description, so find out some of the interesting work or ministry as you could characterize it that Sarah is engaged in. 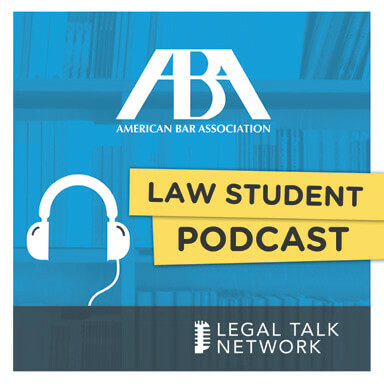 We hope you’ve enjoyed another episode of the ABA Law Student Podcast. We would like to encourage you to subscribe to the show on iTunes and once you’ve done that, please take a moment to rate and review the podcast as well. You can also tweet to us @abalsd and use the #lawstudentpodcast to tell us what’s on your mind. You can find me on Twitter @fabianiduarte. I would also like to thank my co-host for the day, my fellow seminarian Andrew Scott, thanks so much my friend, I appreciate your contributions. Andrew Scott: Thank you for having me. Fabiani Duarte: And thank you everyone for listening. Work hard, play smart, and until next time podcasters. Remembers, US law students at ABA-accredited schools can join the ABA for free. Join now at HYPERLINK “http://www.americanbar.org/lawstudent” americanbar.org/lawstudent.